David Suckling, a police officer in Alexandria, New Hampshire, was hospitalized after being exposed to a powerful opiate during a traffic stop. 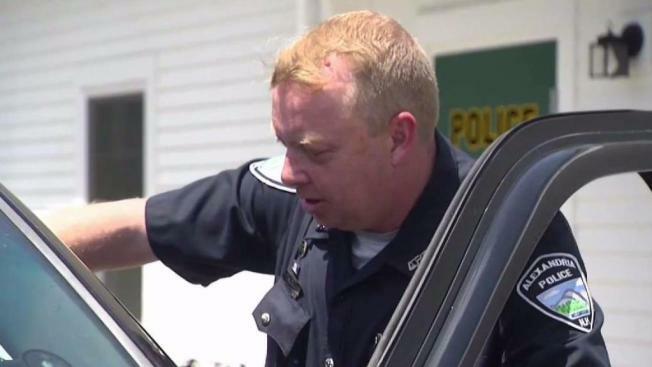 A New Hampshire police officer was rushed to a hospital after being exposed to fentanyl at a traffic stop. As an officer with the Alexandria Police Department, David Suckling is in the business of protecting people, and Thursday was no different. "We're trying to share our story a little bit, so that maybe it doesn't happen to someone else," he said in an exclusive interview with NBC Boston. During a vehicle search Tuesday afternoon, Suckling opened a small container he found in the driver's purse. "I didn't expect there to be a powder in it, for sure," he recalled. "It was a windy day, like today. I opened it and it blew everywhere." With the powdery opiate all over his hands and uniform, Suckling fell ill right away. He was rushed to a nearby hospital, triggering a hazmat situation when he arrived. "There's the secondary danger where it's on my clothes, in my hair, and I'm exposing other people to that danger that I've exposed myself to," he explained. The state lab confirmed the drug was fentanyl — 50 times more powerful than heroin. Suckling admits he's no stranger to those risks. "I point blank made a mistake and I think it's a mistake a lot of people could've or would've made," he said. The drug has become so prevalent in the city of Manchester that first responders have started wearing gloves and face masks. The Alexandria Police chief says they'll likely follow suit. "The world is changing and we have to start changing with it," said Chief Donald Sullivan. Suckling is glad to be back to work and is sending a powerful message to his fellow officers across the state. "Just to have that level of awareness about what we're dealing with these days," he said. "We just don't know, it's the unknown, and we have to be prepared for that." There have been no overdoses in the small town of Alexandria, but police say they deal with drug-related incidents every day. They're making it clear that the heroin and fentanyl epidemic is not just a big city problem.